Are there any configuration options for the Unity desktop? If you're looking to configure Unity 2D, look here. There are two options to edit the settings. Either using the CompizConfig Settings Manager (ccsm) or the Configuration Editor (gconf-editor). I'll describe both ways. Warning: CCSM is in universe and not shipped by default for a reason, it can be flaky, so be careful in there, it can break things, if you find yourself with a broken window manager, see this question to reset your configuration. You can now configure quite a few different settings. Like key shortcuts, the launcher behavior and appearance of the Launcher. The Hide Launcher sets the launchers hide behavior. Never - The launcher will never hide. Autohide - The launcher will hide automatically based on time. Dodge Windows - The launcher will hide when a window would overlay it. 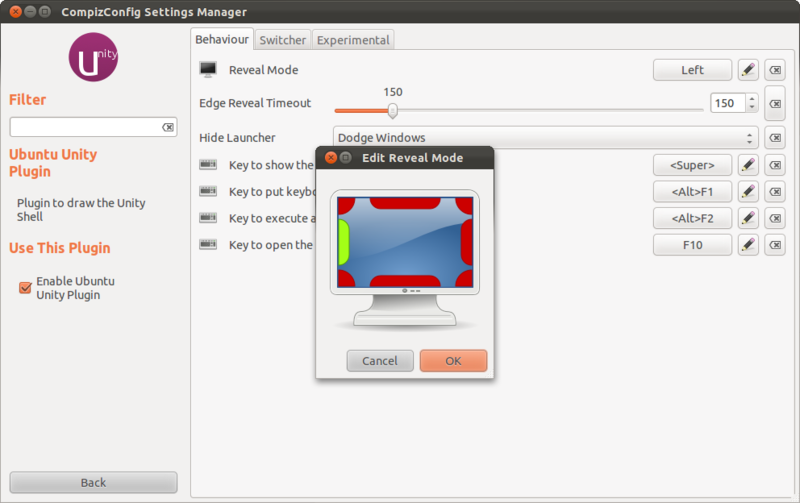 Dodge Active Window - The launcher will hide only when an active window would overlay it. The key to show the launcher which by default is the Super key. This will also affect the key used to show the dash (if tapped) and the shortcuts shown when keeping Super pressed. The key to put keyboard-focus o the launcher so you can navigate using your keyboard (default Alt + F1). The key to open a Search Command dash where you can enter a command name you want to execute. (dafault Alt + F2). 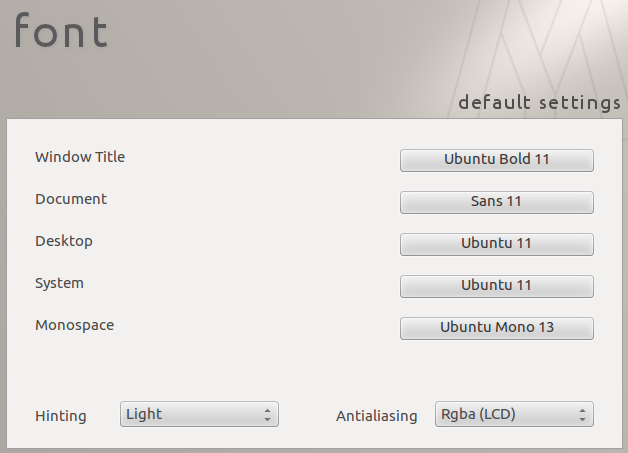 The key to open the first panel menu (default F10). The Backlight Mode sets how the icons are back-lit. Backlight Always On - the icon back light will always be on. Backlight Toggles - the icon back light will be on as long as the application is running. Backlight Always Off - pretty much the opposite of the first option. The Launch Animation sets how the icons are animation. None - no animation will be shown. Pulse Until Running - the icon's back light will pulse till it loads up. Blink - the icon's back light will blink. The Urgent Animation sets how an icon will inform you of something important. Pulse - it will pulse. Wiggle - it will wiggle. The Panel Opacity sets the opacity of the panel. The Launcher icon size sets the size of the launcher in pixels. The Hide Animation sets how the launcher hide and unhide. 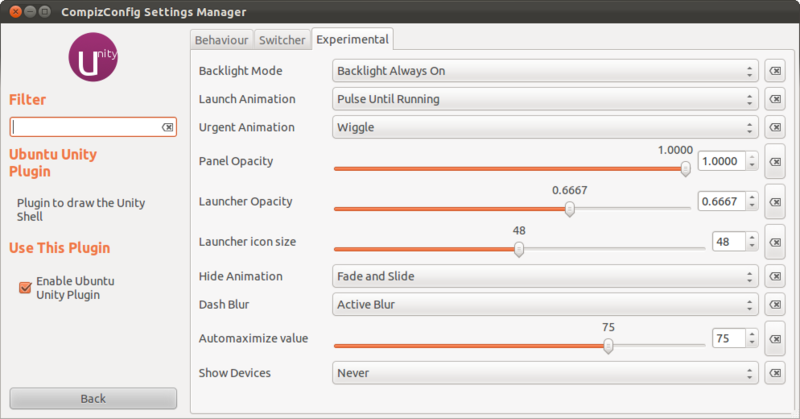 Fade on bfb and Slide - fades based on the position of your cursor in the bfb (big funny button - the one in the top left of your panel with the Ubuntu circle of friends on it) and slides. Slide only - it will only slide. Fade only - it will only fade. 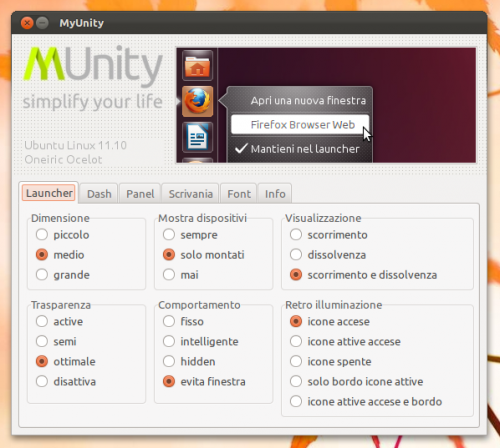 Navigate to apps -> compiz-1 -> plugins -> unityshell -> screen0 -> options. Now you can set settings described above. Clicking on an item will show a short description in the Key Documentation panel. form-factor: The form factor chosen will affect the size of the Dash. Desktop uses a fixed sized Dash, Netbook will always maximize the Dash to screen size, Automatic decides whether to use Desktop or Netbook based on the screen resolution. home-expanded: Whether the home screen of the Dash should be expanded (Expanded) or not (Not Expanded). devices-option: Key for setting the devices that will be shown on the launcher. Never -> never show devices on the launcher, OnlyMounted -> only show devices that are mounted, Always -> also show unmounted devices. favorites-migration: This is a detection key for the favorite migration script to know whether the needed migration is done or not. You don't want to change that. favorites: This is a list of desktop files that show up in the launcher. systray-whitelist: List of programs that are allowed to put icons in the panel's tray area: [''] -> none , ['all'] -> all programs, or a list of program names. There is another option to configure how to show the launcher then it is hidden. 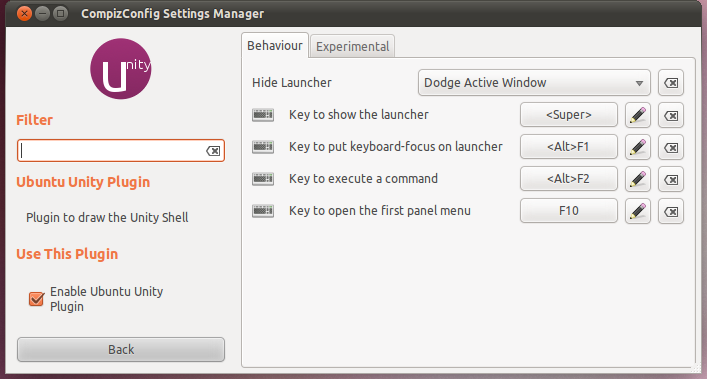 Open the Launcher & Menus configuration utility by pressing Alt + F2 and typing unity-preferences. Pushes the left edge of the screen will make the launcher appear about one second after pushing the cursor to the left edge of the screen. Touches the top left corner of the screen will make the launcher appear immediately when the cursor touches the top left corner of the screen. There are two options to edit the settings. Either using the CompizConfig Settings Manager (ccsm) or the dconf-editor. Note that (some?) changes only appear after logging out and in again (i.e. restarting X). You can now configure quite a few different settings, like key shortcuts, the launcher behavior and appearance of the Launcher. The Reveal Mode sets from which edge the launcher will reveal. 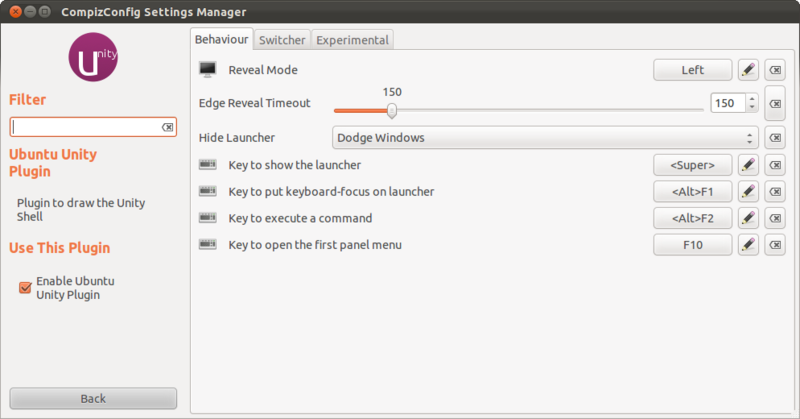 The Edge Reveal Timeout sets the waiting time (in ms) before the launcher is revealed when a window is touching the edge. The key to put keyboard-focus on the launcher so you can navigate using your keyboard (default Alt + F1). Automatically grid windows on timer in switcher: Turn this off if you want don't want to automatically expand multiple windows in alt-tab. Bias alt-tab sorting to prefer windows on the current viewport: Select this if you want alt tab to prioritize the order in which applications are shows in alt-tab. Applications in your current workspace are listed first. 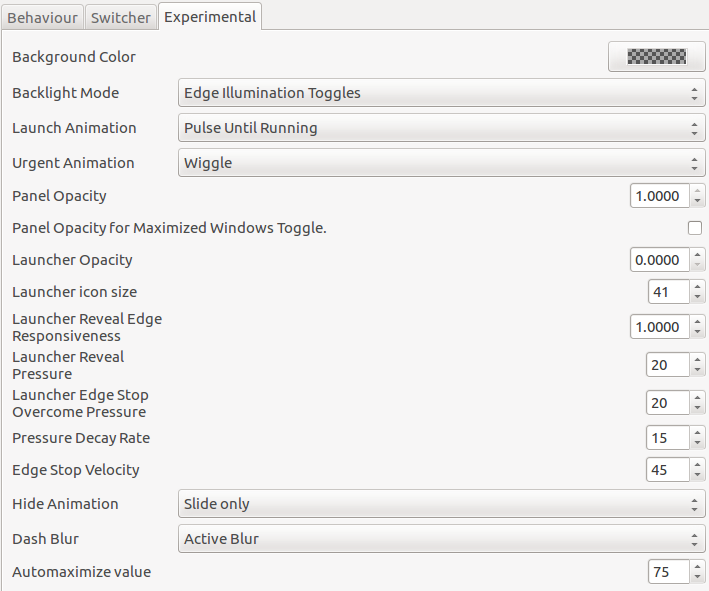 Edge Illumination Toggles - the edge illumination will be on as long as the application is running. Backlight and Edge Illumination Toggles - the backlight and edge illumination will be on as long as the application is running. The Launch Animation sets how the icons are animated. The Launcher Opacity sets the opacity of the Launcher. The Hide Animation sets how the launcher will hide and unhide. 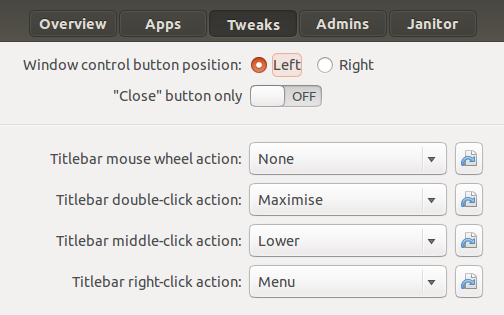 Fade on bfb and Slide - fades based on the position of your cursor in the bfb (big funny button - the one in the top left of your launcher with the Ubuntu circle of friends on it) and slides. Fade and Slide - it will fade and slide. The Dash Blur sets the level of blur in the dash. Active Blur - This means it actively blurs what is behind it. The Automaximize value sets the minimum value to trigger automaximize. 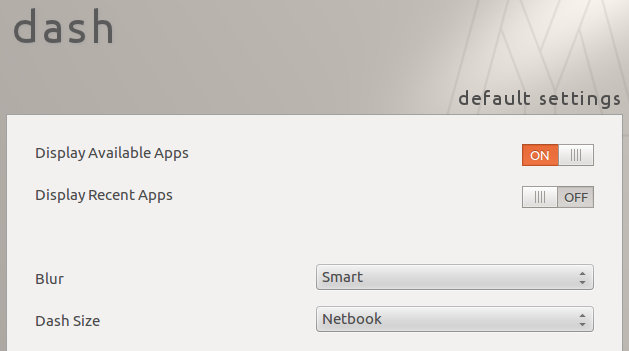 Show Devices sets when to show devices in the launcher. Never - Devices are never shown in the launcher. 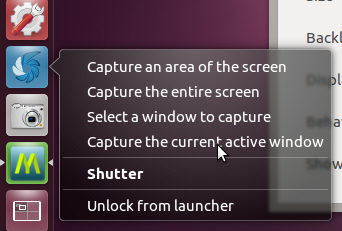 Only Mounted - Device that are mounted are shown in the launcher. Always - Devices are always shown in the launcher. A new feature for Unity in 11.10 is the ability to change the color of the dash/launcher to match the user's current wallpaper. To take advantage of this, simply set a new wallpaper for your desktop, and the color will change automatically to match. The default configuration option installed as standard is User Interface. Note: In previous answers, the utility CCSM was extensively used as the primary configuration tool. The use of this tool is strongly not recommended and can break your desktop. In this answer, CCSM is only used where the other tools do not offer the configuration options discussed. Note that some changes only appear after logging out and in again (i.e. restarting X). how quickly the launcher is revealed - lower the slide bar, the longer the mouse needs to be at the hot-spot to be revealed. Hit Alt+F2 and type myunity and hit enter. 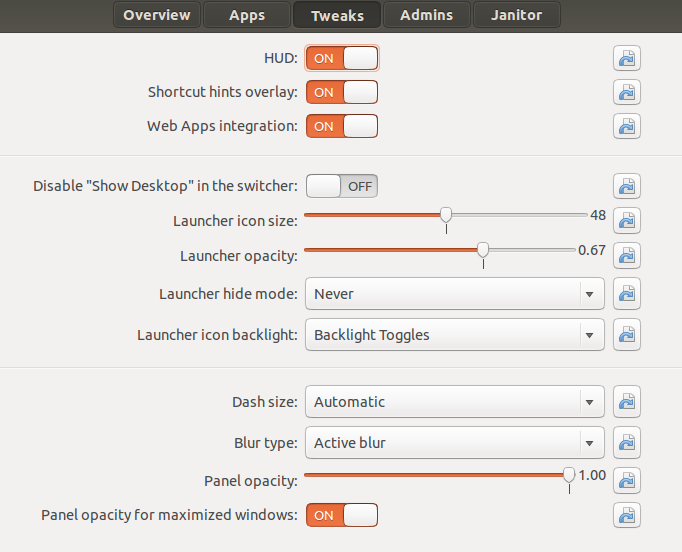 You can now configure quite a few different settings, like the launcher behavior, dash configuration, panel transparency, desktop icons and various font settings. Fixed - The launcher will never hide. Hidden - The launcher will hide when a window would overlay it. Icons On - the icon back light will always be on. Active Icons On - the icon back light will be on as long as the application is running. Only Icons Edge - the edge illumination will be on as long as the application is running. This option allows you to create quicklists - quicklists are a submenu that are displayed when you right-click a launcher icon. Smart - Active Blur - This means it actively blurs what is behind it. Transparency Maximized Toggle - if you are using a transparent top-panel this toggle controls whether an application that is maximised has its decoration also displayed transparently or in the theme colour. Any themes that you have installed or manually installed (/usr/share/themes or ~/.themes) together with manually installed icons (/usr/share/icons or ~/.icons) can be chosen. Where an option is not described, then this functionality can be achieved through MyUnity described above. home-expanded - Whether the home screen of the Dash should be expanded (Expanded) or not (Not Expanded). sub-key Dash - home-lens-ordering - List of lens ids specifying how lenses should be ordered in the Dash home screen. sub-key Devices - favorites - List of device uuid for favorites on the launcher. Note that ccsm is deprecated after 11.10; the same settings are available through gconf-editor in a somewhat safer though less intuitive interface. 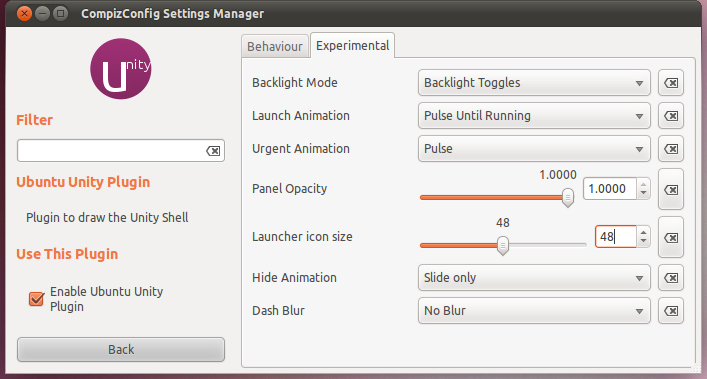 The settings below can be found in by selecting /apps/compiz-1/plugins/unityshell/screen0/options in the left-hand panel. Hit Alt+F2 and type ccsm and hit enter. 1. The key to invoke the HUD - Head Up Display - by default this is the Alt key. Bias alt-tab sorting to prefer windows on the current viewport: Check this if you want alt tab to show only applications in your current workspace, or uncheck it to show all open applications regardless of which workspace they're on. Enable Shortcut Hints Overlay - pressing and holding the Super key displays the keyboard shortcuts overlay. This can be disabled through this setting. Menus Fade-in duration - duration (in milliseconds) that the global menu fade-in animation takes to display when the mouse moves into the global menu region. Menus Fade-out duration - duration (in milliseconds) that the global menu fade-out animation to display when the mouse moves into the global menu region. Note 1: In previous answers, the utility CCSM was extensively used as the primary configuration tool. The use of this tool is strongly not recommended and can break your desktop. In this answer, CCSM is only used where the other tools do not offer the configuration options discussed. Note 2: Whilst Ubuntu Tweak is not in the official repositories, this answer makes extensive use of this GUI tool since the favoured tool - MyUnity was dropped from the 12.10 repositories due to stability issues. Text scaling factor - scale the text font size by the given value. 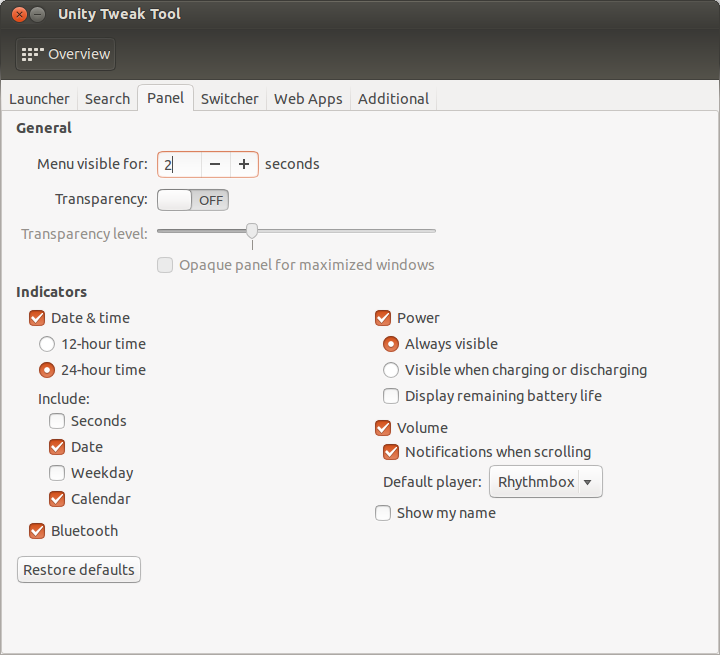 Where an option is not described, then this functionality can be achieved through Ubuntu-Tweak described above. minimize-fast-duration - This is the duration that the minimize animation will have when it has been used more than an number of times equal minimize-speed-threshold. minimize-slow-duration - This is the duration that the minimize animation will have when it has never been used. minimize-speed-threshold - The speed of the minimize animation will progressively get faster as minimize-count approaches this value. sub-key lenses - remote-content-search - "all" is to enable the supported default lens to search from remote and commercial sources. "none" will indicate the lenses to not perform that remote search at all. dontask-domains - This key indicates web applications which the user has blacklisted from accessing Unity integration features. index-update-time - Frequency (in seconds per job) with which unity-webapps-service will spawn the ubuntu-webapps-update-index job. preauthorized-domains - A list of domains which are preauthorized to access Unity Integration. display-available-apps - Display Apps Available for Download in the Applications lens. display-recent-apps - Display Recently Used apps in the Applications lens. use-locate - Use locate during searches to make sure the lens is able to find most of their files even it they're not logged by Zeitgeist. 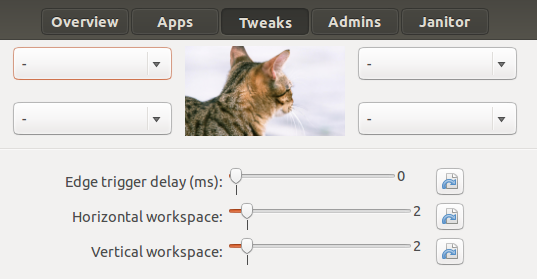 Where an option is not described, then this functionality can be achieved through Ubuntu-Tweak or dconf-editor described above. 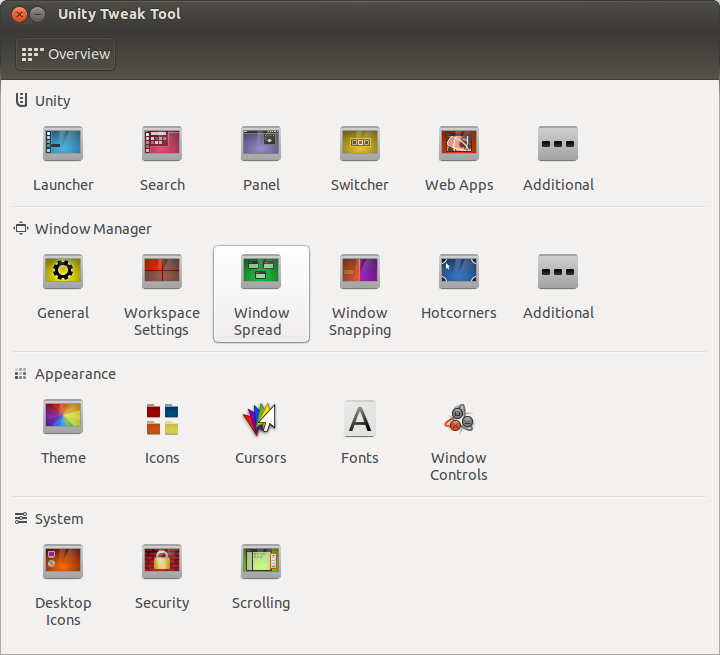 Simple and lightweight graphical user interface to configure Unity in Ubuntu 11.04 and above. 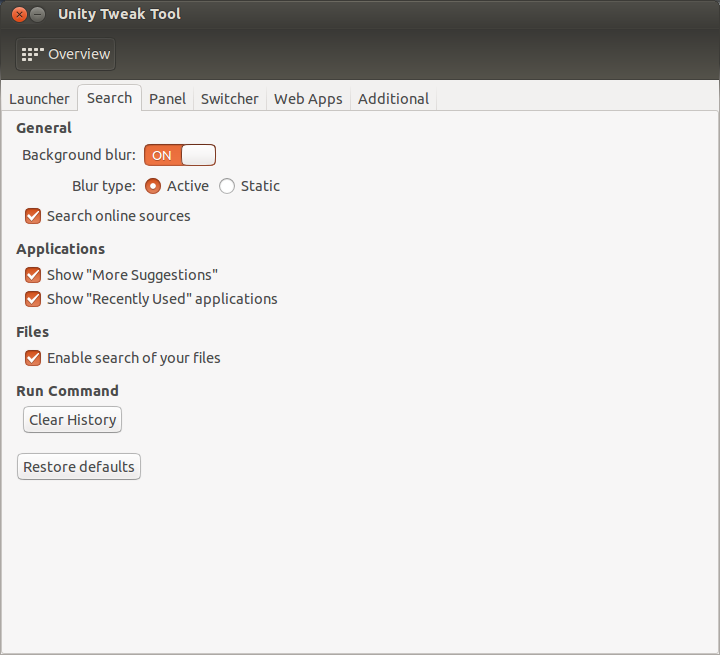 Unity Tweak Tool can be used to configure Unity in Ubuntu 13.04 and later. 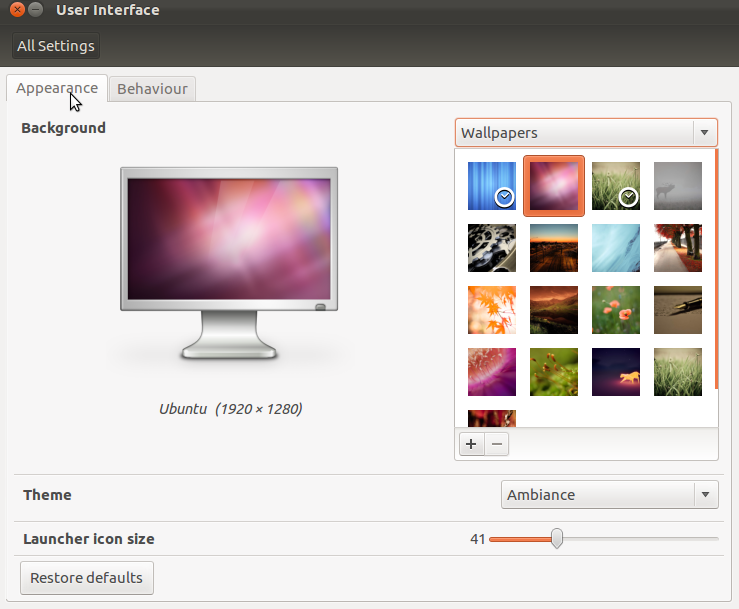 It is also available in a PPA for 12.10 Ubuntu users. To update the package list and install UTT. As you can see UTT has quite a lot of options when it comes to configuring your desktop. note: There is a restore defaults button on every tab that will restore all settings to their default values for that tab. 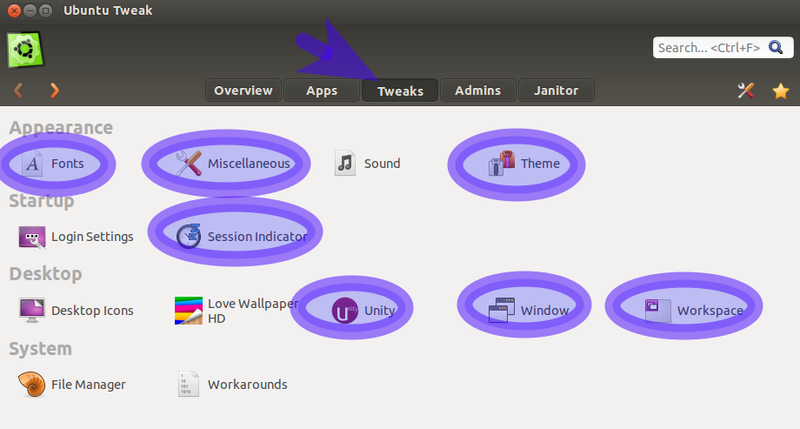 The Unity section contains most of the Unity centric configuration options that Unity Tweak Tool offers. Auto-hide animation: Controls the animation used in auto-hiding the launcher if auto-hide is set to on. Reveal location: If auto-hide is activated, controls whether you can activate the launcher from the sides or only in the top left corner. Reveal sensitivity: If auto-hide is activated, controls the sensitivity of the launcher when giving it focus. Transparency: Controls whether the Launcher is transparent. Transparency level: If transparency is activated, controls the level of launcher transparency. Colour: Controls whether the color of the launcher is based on the current wallpaper or uses a custom color. Visibility: If multiple monitors are in use, controls whether the launcher is visible on all desktops or just the primary desktop. Urgent animation: Controls the urgent animation of launcher icons. 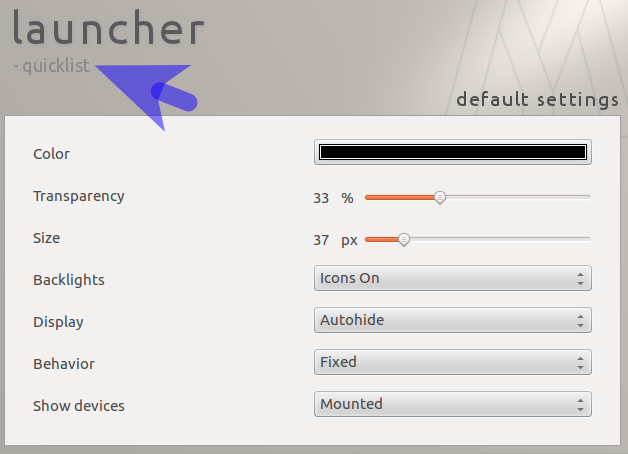 Launch animation: Controls the animation of a launcher icon when the application is being launched. Icon backgrounds: Controls when the icon backgrounds (called "backlight") is on. Icon size: Controls the size of launcher icons. 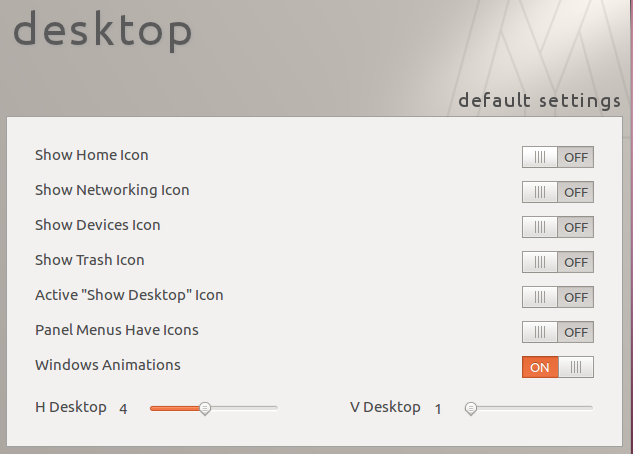 "Show Desktop" icon: Controls whether the "Show Desktop" icon is visible in the launcher. From the search tab you can configure Unity's search. Background blur: Controls whether the background of the dash is blurred or not. blur type: If background blur is enabled, controls whether the blur updates with the background or not. search online sources: Controls whether the launcher shows results from online sources. 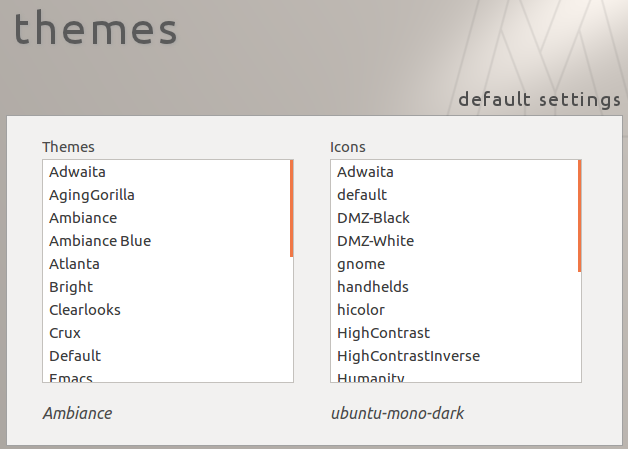 Show "More Suggestions": Controls whether the "More Suggestions" category is displayed in dash results. Show "Recently Used" applications: Controls whether the applications lens shows your recently used applications. Enable search of your files: Enables or disables the ability to search unlogged files from the files lens. Clear history: Clears your Alt+F2 command history. 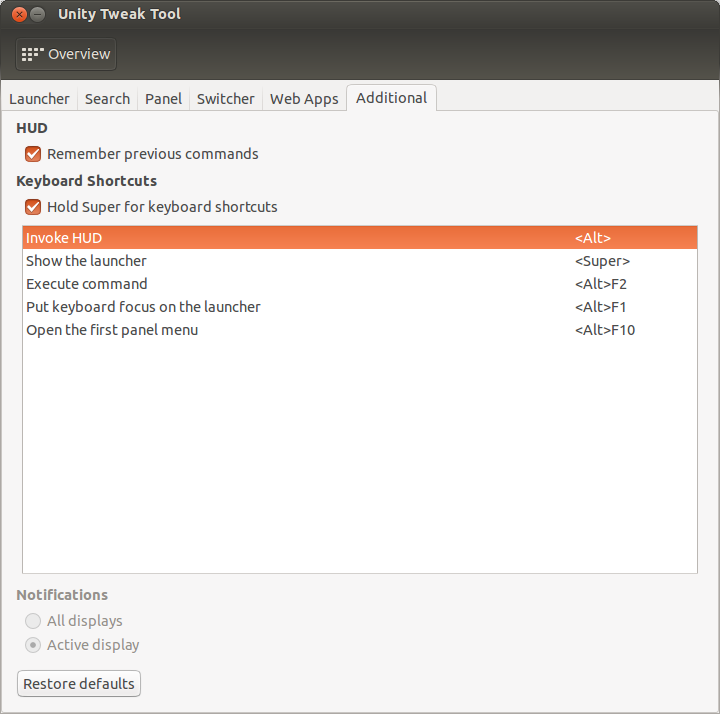 The panel tab controls the settings of Unity's panel. Menu visible for: Sets how long an application's menu is visible when it is first opened. Transparency: Enables or disables panel transparency. Transparency level: If transparency is enabled, controls the level of transparency. Opaque panel for maximized windows: If transparency is enabled, controls whether maximized panel of windows is transparent as well. 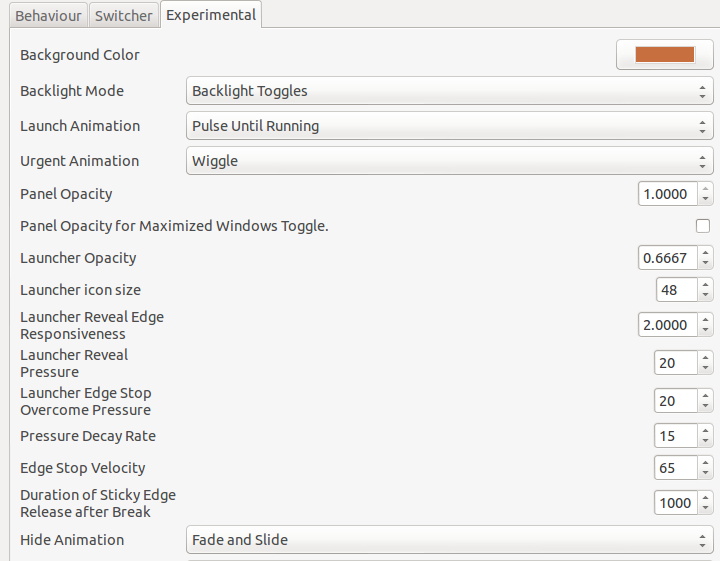 The indicators sections contains settings for fine tuning the indicators in Unity's panel. 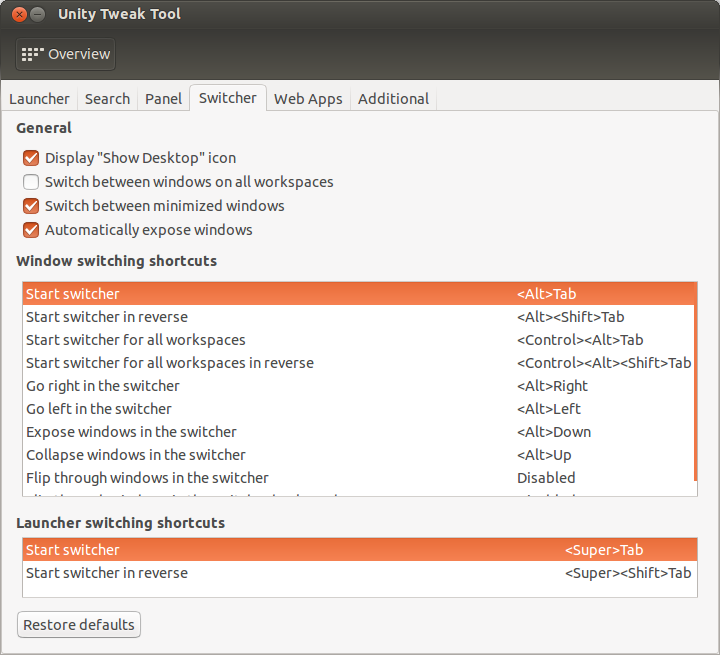 The switcher tab allows you to configure Unity's Alt+Tab switcher. Display "Show Desktop" icon Sets whether the "Display Desktop" icon is displayed in the switcher. Switch between windows on all workspaces: Controls whether the switcher shows applications on all workspaces or just the current workspace. 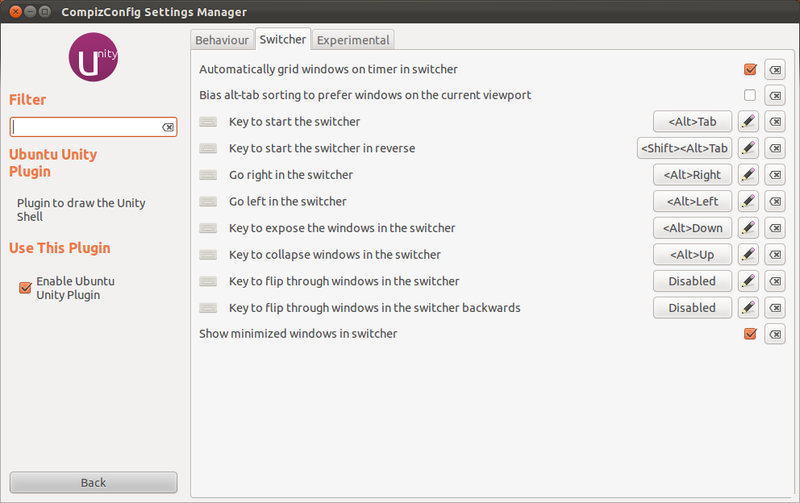 Switch between minimized windows: Controls whether the switcher allows you to switch to minimized windows. 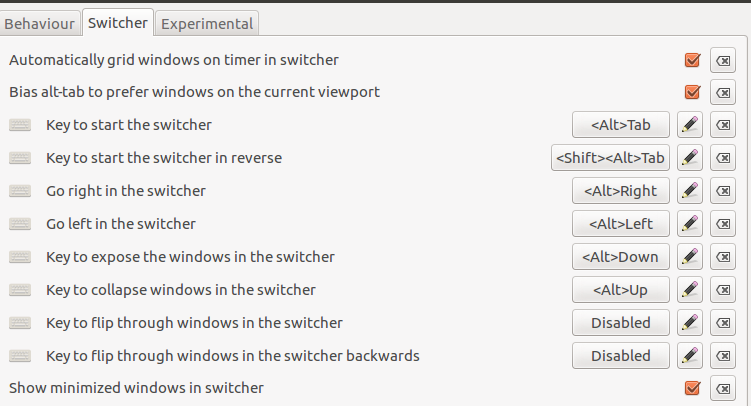 Automatically expose windows: Controls whether the switcher exposes minimized windows. Window switching shortcuts and Launcher switching shortcuts allow you to customize the keys used in the various switcher actions. The web apps tab lets you customize several web app features, including prompts on supported sites. Integration prompts: Controls whether you get an installation prompt when visiting a site with a supported web app. Remember previous commands: Sets whether the HUD remembers previous commands you've used. Hold Super for keyboard shortcuts: When activated, pressing Super will highlight the various Unity shortcuts. 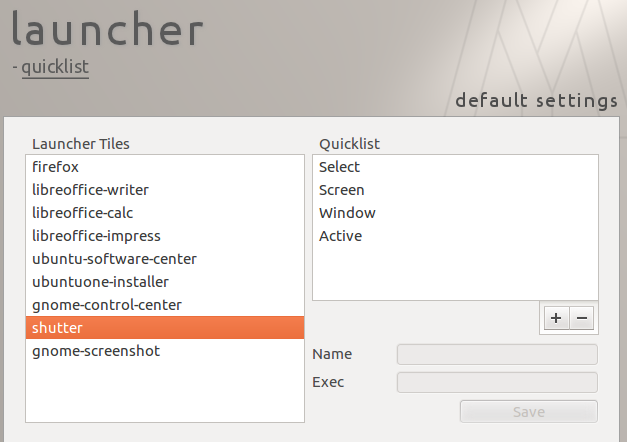 You can also change a few of Unity's launcher keyboard shortcuts. Here you can set whether (in a multiply monitor display setup) notifications are displayed on the active display or all displays. Unity Tweak Tool can do a lot more as well, and I hope to cover everything it can do eventually. You can do a lot of thing, more than many other tools. From now, he is in italian, but I think that english translation will come sooner. Now available in English, refer to OMG!Ubuntu article from December 11. There is an unofficial Compiz plugin that allows you to move the Unity launcher to the bottom (looks out of place and ugly there in my opinion). 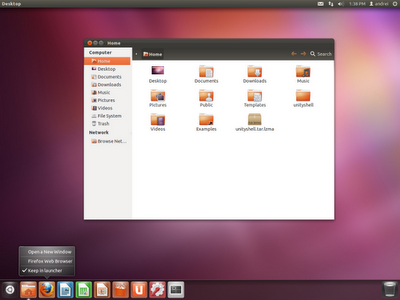 Unity is configured through compiz. Install the CompizConfig Settings Manager (ccsm) from the Software Centre, and look under the desktop section for Unity options. 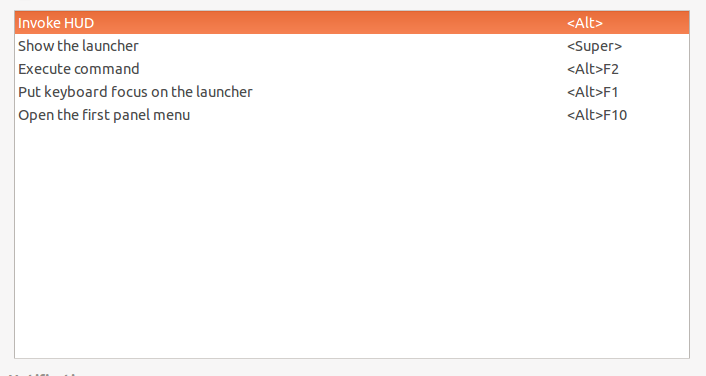 Aside from the CCSM (Compiz Config Settings Manager) configurations described in another reply to this thread, you can also change what menu options appear when you right-click on an application launcher (icon) in Unity through custom launchers and so-called quicklists. For example, you can add STOP, PLAY, PAUSE, NEXT, PREVIOUS to your Banshee icons, you can add your favorite folders to your Nautilus (file browser) icon, you can add common SSH servers to your terminal icon, etc. To find examples and instructions of said quicklists, see another popular question: What Custom Launchers and Unity Quicklists are available?. 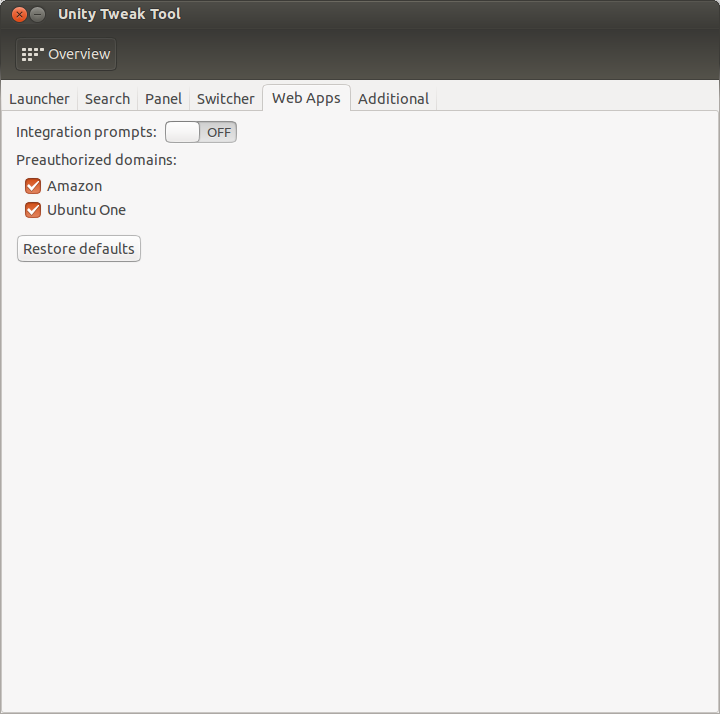 Unsettings is a graphical configuration program for the Unity desktop environment that lets you change some of the Unity settings. Unsettings can only change your users’s settings, you can’t use it to change global settings or do anything else that needs root privileges. 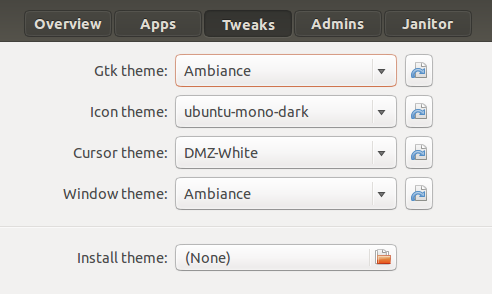 You can use Unsettings to change the themes for GTK, window manger, icons and cursors. But it doesn’t support the installation of new themes. 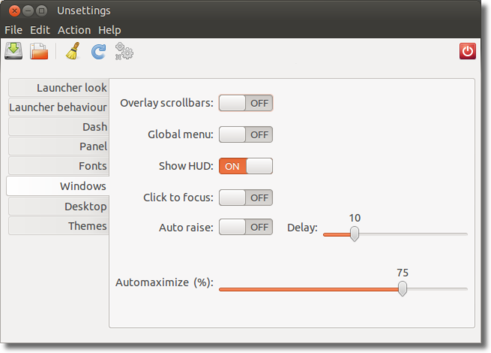 With Unsettings you can switch off the global menu and the overlay scrollbars used in Unity. In addition to just applying the settings Unsettings lets you to save your settings into and load from a text file (JSON format) so you can easily backup you settings or copy them to a different account. 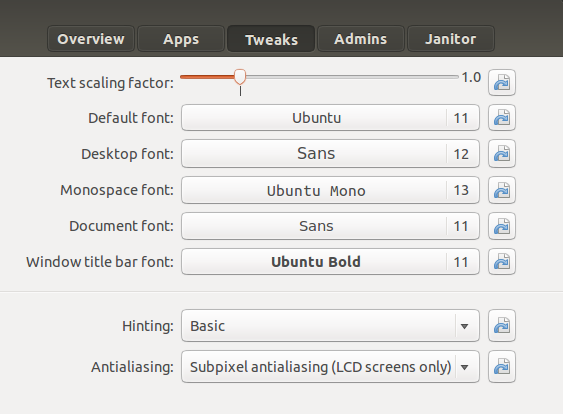 Unsettings is available for Ubuntu 11.10 and later. Can you resize Unity launcher? Can I resize the Unity panel? How to adjust the appearance of the Unity in 12.10? How do I hide the Unity dock? Where are unity settings stored? What personalisation software is available? Which new features and changes are planned for Unity in 11.10? How do I configure Thunderbird Unity integration, particularly the monitoring of selected folders?